Larry Little played college football at Bethune-Cookman College and was signed by the AFL’s San Diego Chargers as an undrafted free agent. 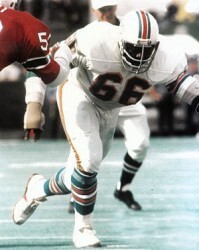 He was traded to the Miami Dolphins and played for the Dolphins throughout the 1970’s. The Dolphins were known for their punishing running attack and as a guard. Little was one of the biggest reasons the Dolphins were able to run with so much authority. 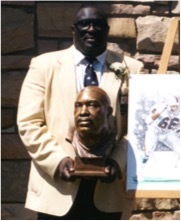 In 1999, Larry was ranked number 79 on The Sporting News’ list of the 100 Greatest Football Players. He was also named to the FHSAA All –Century Team. He is apart of the NFL Hall of Fame and was a five-time Pro Bowl selection, AFL All-Star, a member of the 1970 NFL All Decade Team and he is on the Miami Dolphins Honor Roll.